Balance, originally uploaded by Telzey. 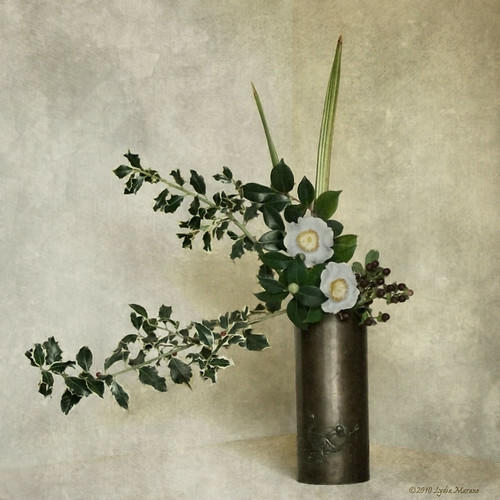 Ikebana is a disciplined art form which draws emphasis toward shape, line, form. It has certain rules governing its form. The artist's intention behind each arrangement is shown through a piece's color combinations, natural shapes, graceful lines, and the usually implied meaning of the arrangement. The structure of a Japanese flower arrangement is based on a triangle delineated by three main points, usually twigs, considered in some schools to symbolize heaven, earth, and man. Adding the texture: After some initial clean-up, I darkened my image slightly using a silvery black and white adjustment layer. Next came my Bending Light texture, Khartouom, applied as an overlay at 100%. A layer mask was used to bring back some detail. Then, I duplicated that layer and applied it as a Linear Burn at 50%, 80%. Further post production used photoshop filters, a bit of pouting, and a cup of Kona. Life is good. Hopefully, I'll figure out how to share some textures soon.